What Is The Flying Gallop In Equine Art? Have you ever looked at early artwork of horses galloping and thought to yourself: "What was the artist thinking?!" Up until approximately the late 1800s, horses in art were often shown running in a position that came to be known as the "flying gallop." In the flying gallop horses were portrayed with both front legs extended forward in the air at the same time both back legs were extended backwards in the air. These drawings, paintings, and sculptures look comical to us today, if not downright weird. 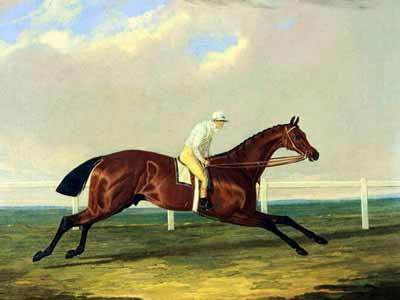 Below: An early or mid 1800s painting by John Frederick Herring, Sr., showing a horse galloping in the position that came to be called the "flying gallop." However, artists weren't attempting to be humorous when depicting this odd running style. Instead, before the availability of photography to show us the actual movements of a horse's legs during a gallop, all anyone really knew for sure was that their legs moved too quickly to get a good look at them. Therefore, a horse's leg sequence during a gallop was a mystery, so artists had to represent this mystery the best they could. The result was often the "flying gallop," which, of course, is nothing like a horse's actual leg movements (although it can be amusing to look at in artwork). Eadweard Muybridge (1830 - 1904) was an English-born photographer who came to America at age 20. While he is recognized for his photographs of the American West, he is probably best known for his groundbreaking work using photographs to study animals in motion. Perhaps Muybridge's most famous photos show a horse named Sallie Gardner galloping on June 19th, 1878. Hired by Sallie Gardner's owner, the wealthy American tycoon and politician Leland Stanford, Muybridge used numerous cameras triggered in sequence to capture the mare's movements as she galloped. The resulting series of photographs were groundbreaking. They not only showed the sequence of a horse's legs at a gallop, they also settled the dispute of whether or not a horse had all four legs off the ground at the same time when galloping (yes, they did). However, in quite a surprise to many, when all four feet were off the ground they were underneath the horse, not extended out front and out behind as so often depicted in the flying gallop. 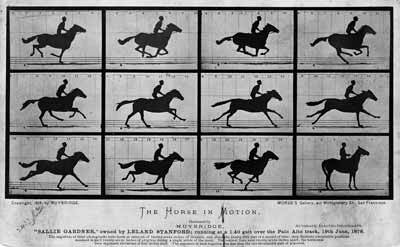 Below: Eadweard Muybridge's famous sequence of photos showing the horse Sallie Gardner at a gallop. The same series of images as seen above, shown automatically one after the other so they appear to be moving. As Eadweard Muybridge's series of photos showing Sallie Gardner galloping became well known, it was the beginning of the end for the flying gallop in artwork. For example, this is a postmark for the Pony Express demonstrating a horse in the flying gallop. It was created in 1860, 18 years before Muybridge's photos of Sallie Gardner. Compare it to the following image. 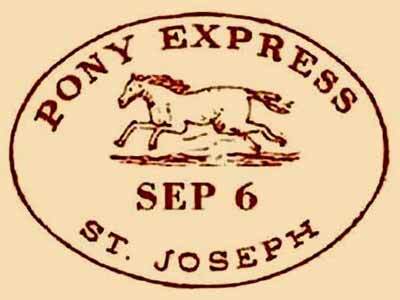 Below: An 1860 Pony Express postmark. 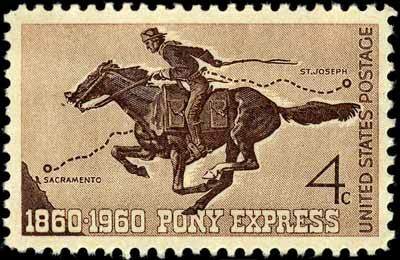 This commemorative stamp was created in 1960 to recognize the 100th anniversary of the Pony Express. This was was 82 years after Muybridge's famous photos. By this time, the flying gallop in artwork was a thing of the past and the horse in the illustration shows leg movements that are more realistic. Below: A 1960 commemorative stamp. The difference in the horse's leg movements when compared to the illustrated postmark (previous image) is remarkable. On an interesting side note, Muybridge's innovative, fast-action photography led to a different kind of kind of breakthrough in addition to a better understanding of animals in motion. It was observed that his images, when viewed quickly one after another, appeared to be moving. Many people consider this to be the precursor to moving pictures, which later became better known as "motion pictures" or "movies."